After his forces took control of China by civil war in 1949, Mao Tse-tung became chairman of the People’s Republic of China and leader of the Chinese Communist Party. His “Great Leap Forward” and Cultural Revolution were “ill-conceived” and led to the biggest famine and genocide in known history. Historians estimate that Mao killed an estimated 70 million people, either directly or indirectly because of his policies. He came from humble origins. Mao was born in 1893 to a peasant family in the province of Hunan. He left home in his teen years to attend school in Changsha. There he joined the Revolutionary Army and the Kuomintang, the Nationalist Party. The Kuomintang, led by Sun Yat-sen, overthrew the monarchy in 1912 and founded the Republic of China. Mao remained active politically while working as a librarian assistant at Beijing University. After the Russian Revolution succeeded in establishing the Communist Soviet Union, Mao adopted Leninist ideas and joined the Chinese Communist Party. There he rose up through the ranks until he became the executive to the Shanghai branch. When President Sun Yat-sen died in 1925 and Chiang Kai-shek succeeded him, the Kuomintang government launched a violent purge of the Communists. Mao joined the fighting, leading a makeshift army against government forces. His rebels were driven to Jiangxi Province where Mao worked to establish the Soviet Republic of China. As chairman of the new party he organized an army of guerrilla fighters. In 1934 Chiang Kai-shek launched a massive military sweep designed to eliminate the Communists. As the large army moved in Mao led his guerrilla troops and followers, estimated to have numbered over 100,000, on what became known as the “Long March” over 8,000 miles of mountainous terrain to northern China. Only about 30,000 survived. In the meantime, Japan invaded China. Chiang’s forces were caught attempting to fight wars on two fronts. Chiang called upon the Communists for a truce and asked for support in fighting the Japanese. Mao agreed and led his fighters in a campaign against Japan. After the Japan surrender in 1945 Mao’s forces were in a better position to fight Chiang Kai-shek and a bloody civil war broke out. Chiang Kai-shek and his followers were driven to the island of Taiwan where they formed the Republic of China. Mao established the People’s Republic of China on the mainland. This is why China remains divided into two parts to this day. Once in power Mao instituted sweeping reforms, often using force to seize land and converting it into people's communes. There were positive changes in education and access to health care so people became more literate and began living longer. But in bringing about many of his policies by force he created dissent among the people. In retaliation Mao chose to crush his critics. Thousands of people were imprisoned. In 1958 Mao launched his "Great Leap Forward" which was an effort to increase agricultural and industrial production. He established large communes with thousands of people working in the fields and factories. His plans fell to ruin because of three years of floods and bad harvests. His hopes for massive steel production also fell into failure. The nation was struck by the worst famine in human history. An estimated 40 million people died of starvation between 1959 and 1961. The disaster was kept secret from the Chinese people and the world. It was said that even Mao was kept in the dark about the severity of the disaster by his own party leaders. By 1962 Mao was losing control of China and his rivals were moving into power. During this time, Lin Biao, a supporter of Mao, collected some of Mao's writings in a handbook and produced the well-known "Little Red Book" titled Quotations from Chairman Mao. Copies were distributed to all the people. The Red Book was a prelude to Mao's dynamic return to power by 1966. This was when he launched the Cultural Revolution. The 73-year-old dictator and his aides choreographed public rallies involving thousands of young supporters thus promoting his "Great Leap Forward." Mao told the people that bourgeois elements were attempting to restore capitalism the created the Red Guards among the youth, assigning them to conduct a mass purge of the "undesirables." He ordered the schools closed and the young people living in the cities were sent into the country to learn through hard labor. His revolution created general economic and social chaos. It was during this time that Mao held his famous meeting with U.S. President Richard Nixon, thus easing tensions between the two nations. During his reign Mao was said to have been portrayed as a great political strategist and military mastermind. While considered a political genius he left a legacy as a genocidal monster. 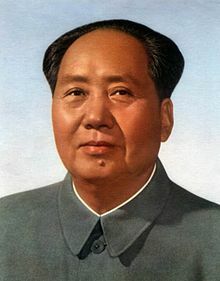 Mao died in 1976 from complications of Parkinson's disease. He was 82.